Who doesn't love stripes!?! And, butterflies with purple diamonds? I have two challenges this week involving stripes. CAS-ual Fridays asked that we make CAS cards with strips of color or pattern. 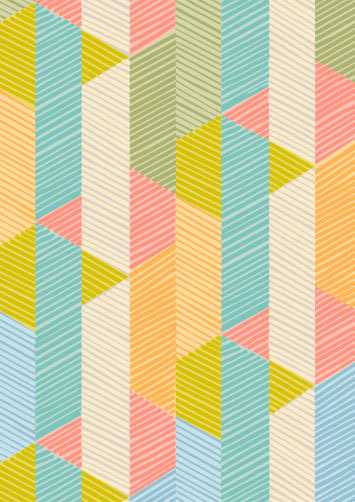 And, the inspiration photo for the Tuesday Trigger Challenge in the Moxie Fab World is covered with multi-colored stripes (photo below). To make my card, I stamped the stripes on a white cardstock base using TPC Studio's Patterned Borders collection with purple, turquoise and orange ink. The stamps are plenty long enough to go all the way across even a larger card, but I wanted to stagger them to match the design I had in mind. I punched that gorgeous, turqoise butterfly with a Martha Stewart punch. 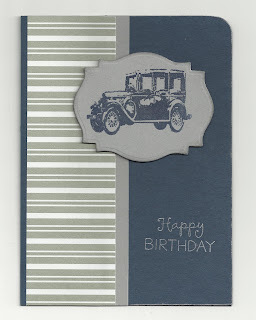 The purple gems are from Studio G.
I'm entering this card in the Birthday Card Challenge in the Moxie Fab World. The challenge is to make a birthday card where stamping is the featured technique. I love working with black and white. They can make almost any card look elegant. The heat-embossed hummingbird is a stamp from Inkadinkado's Mindscapes collection. Take a close look at this hummingbird. It is not all that it seems. 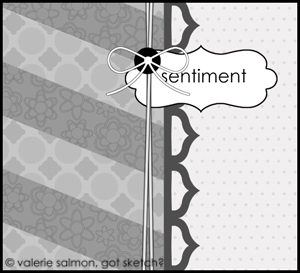 The sentiment is from Fiskars' All Year Cheer collection. It is also heat-embossed. I created this page for DCWV's July Layout Sketch Challenge. I used DCWV's The Painted Petals and The Chateau Lavendar stacks. I make 8.5 x ll pages because that's the size that fits my bookcase. I took these pictures in the first few days that April, our sweet toy poodle, came to live with us. It was just too funny seeing her on her tiptoes and stretching as far as she could to get a good look on the coffee table. And, if we did not have things in the center of the table out of her reach she would grab whatever it was and take off running. She still loves stealing things from us. She is so curious and wants to see everything. I created this card for the Die Cuts With a View July Card-Sketch Challenge. I made the dusty pink card base from DCWV's﻿ Le Tres Chic cardstock stack. I used the same cardstock for the sentiment panel and the butterflies. I heat-embossed the sentiment and panel. Even though the cardstock is textured, it took my stamping very well. And, I am really picky about my stamping. I like it very neat and sharp. All the patterned papers came from DCWV's The Heirloom stack. Erin at DCWV has some great tips for cutting the angled strips. Check it out here: http://dcwvinc.blogspot.com/2012/07/july-stack-holic-challenge.html You will also find info there for the challenge if you want to join in on all the fun. There is still plenty of time. This is the sketch we had to work with this month. I like this sketch so much that I think I will use it as a guideline to make a scrapbook layout. Wouldn't it be pretty! This week's challenge requires us to include text on our cards. Taking advantage of the flexibility of the cling stamps, I curved the sentiment as I put it on my acrylic block to make a kind of path for the bicycle. Both the bicycle and the sentiment are from Hero Arts Joy Ride Collection. I will also be submitting this card to the Hero Arts July Contest. I found a wonderful new blog called Cas-ual Fridays. They have challenges each week for clean-and-simple cards. This week's challenge is to make a CAS card with two circles. Here's my entry. This card looks more difficult and involved than it is. All the cardstock is from DCWV Coral Couture stack. The two circles were cut from a patterned sheet of cardstock from the collection. The ribbon is cut from another sheet as is the dotted-swiss card. Very quick and easy. The sentiment from Studio G is stamped in black.